It’s 1:30 pm on Halloween as I write this, so let’s pause for a moment and raise a glass (of whatever spirit you have on hand) to the passing of one of the greatest performers of the 20th century: Erich Weiss, aka Harry Houdini. Part 1 and Part 2 covered Houdini’s early life and performances in Detroit, all the way up until this moment. And I promise this WILL be the last post. Pardon my enthusiasm, but Detroit history and Halloween mysteries just get me going. 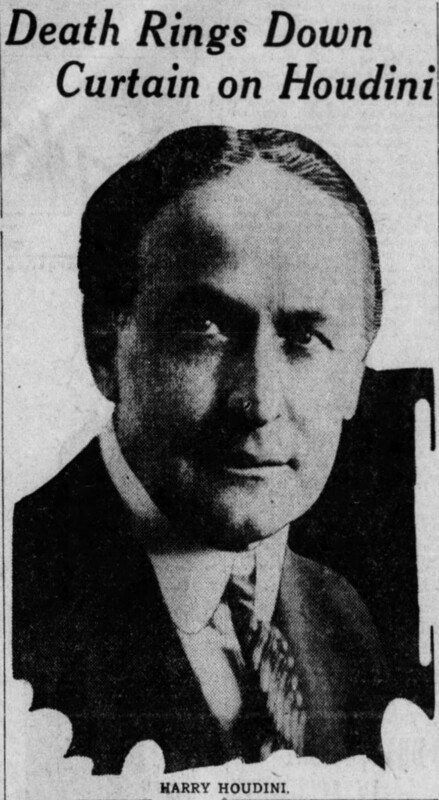 After his final and incomplete performance at Detroit’s Garrick Theatre (see here for a slideshow of his last spots), Houdini suffered through two unsuccessful surgeries and a whole lot of agony before finally succumbing to acute peritonitis. While many believe that his death was a direct result of a blow to the midsection that ruptured his appendix, later investigations would prove that he was likely already suffering from appendicitis during that fateful Montreal encounter with an overzealous young fan. If anything, Houdini delayed treatment because the pain of his already-ruptured appendix was masked by the pain from repeated punches to the gut. According to witnesses, Houdini’s final words to his brother were “I guess I’m all through fighting.” He died at 1:30 pm on October 31, 1926, in Room 401 of Grace Hospital. 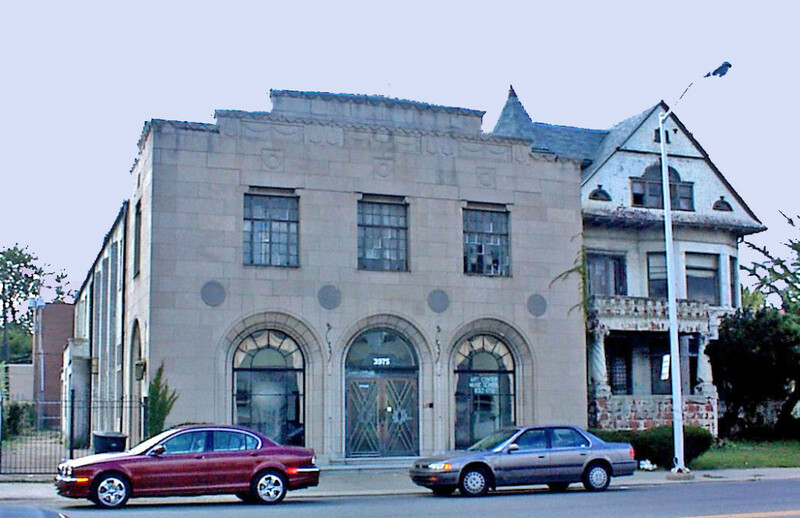 His body was quickly transported to the William R Hamilton Funeral Home on Cass at Alexandrine, where it was embalmed and placed into a trick coffin that Houdini had just had completed. Once a more suitable coffin was found, the body left through Michigan Central Station on a special train car to his home state of New York, where he was buried with much pomp and circumstance in a glass-topped coffin covered in flowers from fans and family. 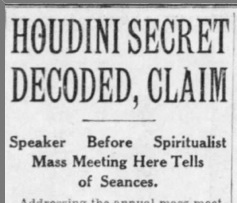 Immediately the speculation began: would Houdini reveal any secrets from beyond the grave? The famous skeptic and myth buster had for years offered a $10,000 reward for proof (scientifically verifiable) that the dead could communicate with the living. And, as the investigative ace that he was, “all magic dissolved before his scrutiny” according to a later AP obituary. Harry and his devoted wife Bess had an agreement worked out well in advance to test, once and for all, the spiritualists’ claims. This was a series of words, nonsensical and tough to guess, that was to be “passed on” to a medium from the first one of the couple to die. Here’s the message: “Rosabelle answer tell pray answer tell look answer answer tell.” “Rosabelle” was the title of a song that Bess sang in her early days performing with her husband. For years and years…and years…and years, believers and skeptics held seances all over the country. The devoted were trying one last time to reach out to the great performer for confirmation of life after death. Either that or they were trying to cash in on the $10,000 reward that Bess continued to offer until ten years after Harry’s death. Halloween of 1936 saw a massive flurry of seances, from Bess’s Hollywood event attended by 200 people to graveside ceremonies and Grace Hospital attempts. Benjamin B. Fenton, of 2432 West Boston Blvd, gathered 26 faithful with medium Harry Cecil. Cecil implored, “For ten years your wife and friends have attempted to communicate with you. This is the final experiment. If we do not hear from you, we know that we never will.” Theo Hardeen, Houdini’s brother (who, really deserves his very own article) attempted to reach Houdini too. For all attempts, there was the same result: complete silence. Arthur B. Ford did it! He conveyed the exact sequence of words required to prove that Houdini was speaking to him through the veil. Miracle of miracles! So, as it turns out, Ford did get his hands on one half of the puzzle. But he jumped the gun and was quickly discredited. Ford, by the way, continued his shenanigans and made a fair bit of money pretending to channel Houdini’s spirit to gullible small-town audiences who hadn’t read up on the debunking scandal. He also managed to drink himself to an early grave off of those proceeds. There has been no word from Ford since his death. In 1978, magicians gathered in Marshall, Michigan’s American Museum of Magic for another attempt. This time they brought a special enticement: bagels and lox. Still nothing. If that can’t bring Houdini back from the grave, then I’m pretty sure we should just leave the poor guy alone now.